SUPER BASIC is a series dedicated to honest, uncomplicated recipes. Superfood is a marketing term to describe a food that is nutrient-dense and beneficial to your well-being. Despite its controversial name, I like superfoods. They are often accessible, affordable and easy to incorporate into your diet. 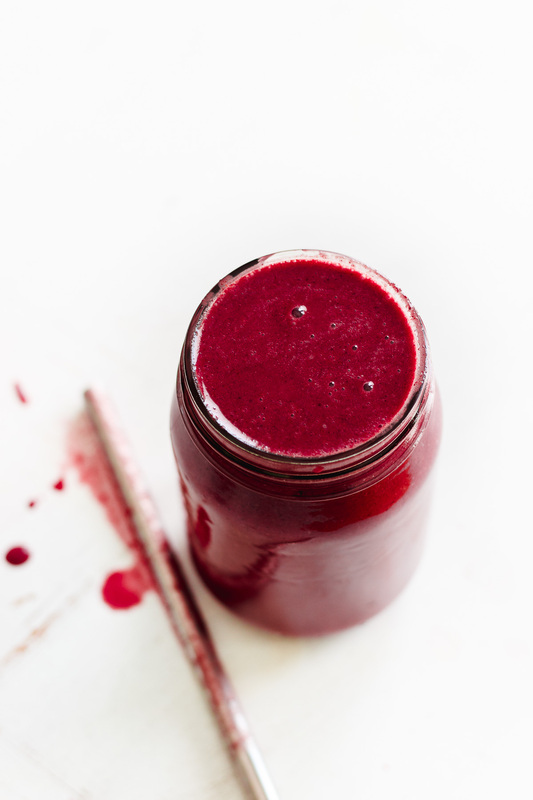 And this berry superfood smoothie, is exactly that. For general health reasons I adopted an anti-inflammatory diet over a decade ago. And all of the recipes on With Food + Love reflect that. But since my endo diagnosis, eating anti-inflammatory foods matters even more to me because they are especially helpful to those with chronic illness. I’m a big fan of Dr. Weil and the work he has done to promote the benefits of an anti-inflammatory diet. He claims that berries are among some the of biggest anti-inflammatory foods. As well as turmeric and ginger. And this superfood smoothie has all three. 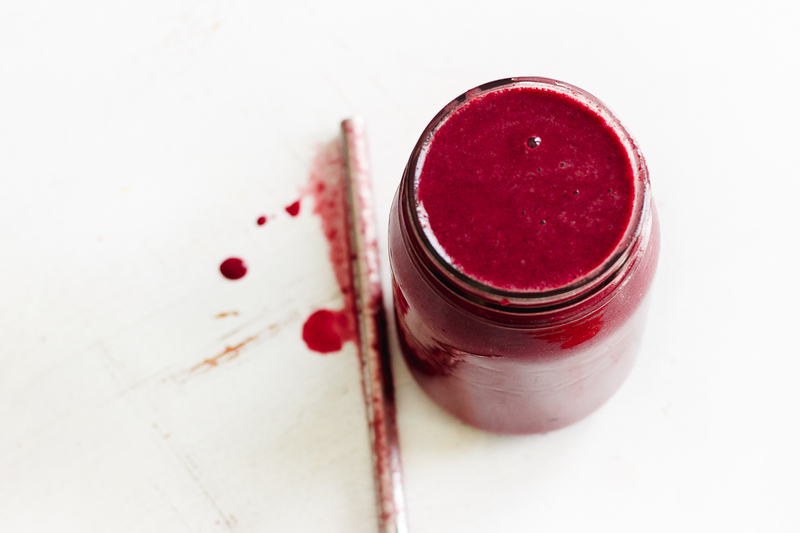 A superfood smoothie recipe for everyone. 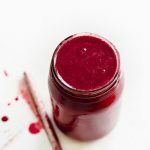 The reason I love this superfood smoothie so much is because it is approachable. And it is made with ingredients you already have in your pantry. It doesn’t require anything extra or obscure. As long as you have good quality ingredients, you’re golden. A few tips. The berries can be fresh or frozen, use whatever you have on hand or what’s in season. I use a mixture of unsweetened plant-based milk and water. It really depends on what I’m in the mood for or what I have on hand. I put apple cider vinegar into all of my smoothies. It provides a natural sweetness and helps regulate your blood sugar levels. It may seem strange to add pepper in a smoothie, but don’t skip it. The pepper enhances the curcumin in turmeric (the good stuff) and the taste is negligible if noticeable at all. The little bit of fat is also not to be skipped. It helps you feel fuller longer and helps your body absorb the nutrients better. Feel free to experiment and make this recipe your own. Place all of the ingredients in a blender and process until totally smooth. Any preferred milk (dairy or non-dairy), unsweetened tea (like green or hibiscus) or plain filtered water will work for the liquid. MCT oil is a wonderful healthy fat to incorporate into your diet. If you are new to MCT oil, start out small (1 teaspoon) and gradually increase (to 1 tablespoon) to avoid digestive pain. Alternatively, you can substitute coconut oil for MCT oil. These are my favorite stainless steel straws. More superfood recipes you will love. « LIVING WITH ENDO – WHAT IS ENDOMETRIOSIS? Thanks Sherrie! I like Dr Weil too. I’ve been a fan for years! I’ll give this a try. Could I add plant protein powder? Hi Jill – he’s wonderful, right? Yes, you definitely can add protein powder.